October 10 is World Mental Health Day. Here at M3Yoga we are huge believers in taking time to tend to your mental health. It’s some times harder to take care of our interior self since we can’t notice obvious problems like we can with our exterior self. Below is a list of 31 ways to boost your mental health this month, or any month. Try and tackle one each day and see how they make you feel or think. Write down some goals in a journal or make a list of things you are grateful for. Try disconnecting from your phone, laptop or any other electronics. Instead, spend time engaging with something you love, a hobby, a book or even your dog. Make sure you are getting enough sleep. Try starting a bedtime routine, so your body knows when to start winding down. Some phones even let you set sleep goals and timers to help you stay on track. Cook yourself a fun, yummy meal or try that new recipe you’ve been wanting to make to spice things up. Bring out your inner child and attempt some coloring or painting. It doesn’t have to be a van Gogh, it just has to be enjoyable! Try being a tourist where you’re at. There are so many interesting restaurants and venues in the Athens area that you have probably never experienced. Go try something new or walk around without any set destination and see what you stumble on. Go to your local coffee shop and enjoy a cup of coffee or tea. Celebrate the little things that happen, whether it be the nice weather outside or your favorite song coming on the radio. These little things can add up over time. Taking time to appreciate them also will help you naturally become more grateful and aware of life’s hidden joys. Hug someone or something. These could be a person, dog, or even your favorite stuffed animal. Join a group or club. It’s great to spend time with people that share the same interests as you. Travel somewhere new. This doesn’t have to be a different country, but maybe a neighboring city. It’s refreshing to get outside your own bubble and routine from time to time. Listen to music. Make a playlist of all your favorite songs that make you happy. Embrace saying no. Every now and then you need time for yourself, and it’s important to prioritize your well-being over pleasing others. Counter your negative thoughts with positive ones. Any time a negative thought pops in your head, write it down and under it write down a positive thought. Volunteer with a local organization. Athens is full of amazing groups, and volunteering can enrich your life. You may even learn something about yourself that you didn’t know before. Open up to someone. You never know who you could help. Opening up about your own experiences can create deep, meaningful connections with others. Decorate a space in your home and surround yourself with things that make you happy. This helps you get in touch with your creative side. Try karaoke or singing. This doesn’t have to be in a crowded place. It can be in your bedroom or, even better, in the shower. You don’t have to sing like Mariah Carey, you just have to sing. Express kindness to a friend or even a stranger. When you make someone else feel good, it also helps with making yourself feel good. We also believe that when you put good energy out there, you get it in return. Watch your favorite movie or TV show. A short, fictional break from the world can be very healing. Hold a “Me Day.” A day in which you do what you want, when you want. Eat at your favorite place, maybe take yourself to a movie or go buy a new outfit. Eat something healthy. It’s important that you take care of your body. It’ll also give you more energy to do the things you love. Call a loved one or friend you haven’t spoken to in a while and catch up. Do your best to not to sweat the little, annoying things like traffic, or rude people. Try turning these negative things into positive ones. It will help you in the long run. Smile! Not only is it one of the easiest ways to reduce stress and boost your mood, but smiling is also contagious. Remember there is so much in life to smile about and be thankful for. 31. 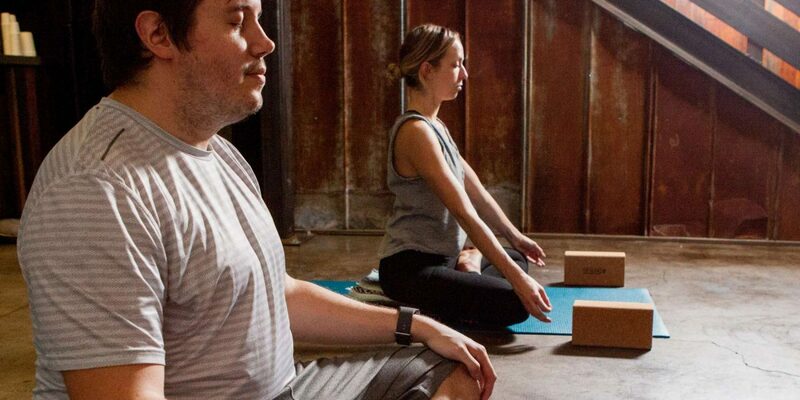 Of course, one of our favorite ways to boost mental health is with a yoga class. You can sign up for one here.